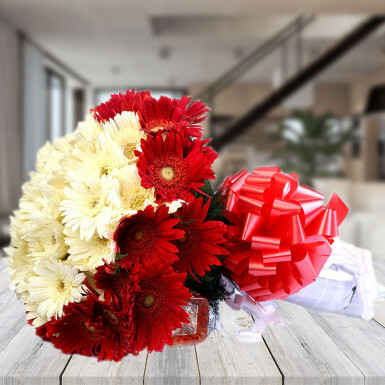 20 Red Gerbera Outside and 20 White Gerbera Inside Bunch in ribbon wrap. This special arrangement is for the special person. This bunch looks beautiful with the combination of flowers. This is a wonderful gift for your dear ones on any occasion. The fresh look of this bunch will freshen up the environment around. One of the most beautiful arrangements, this is definately going to to leave a mark on the reciever's mind and heart.